Residential fencing is surprisingly versatile. From extra privacy, to security, to aesthetics, there are plenty of reasons to get a residential fence in Richmond. See how a fence can benefit your home in our blog! Fences offer a lot of potential when it comes to aesthetics and decoration. Installing a fence is a great way to boost your home’s curb appeal. Great fence design can really compliment your landscaping and hardscaping well. If you’re creatively minded, a fence might be the missing component to your outdoor living setup. Decorative fences also don’t have to interfere with your sight lines. You can install a short fence between 2-4 feet high to create the lines you want without blocking your sight. If you’re living in close quarters and want a little privacy, a privacy fence can help. Use vertical boards with no spacing to prevent your neighbors from seeing in. Framed panels are another option. The fence should be at least 6 feet tall. Wood fences make ideal privacy fences. Fences can also be used to keep people out of your property. The fence should be at least 6 feet tall and have sharp pickets on top. The pickets should face out so that the outer face is smooth. This ensures there are no footholds that would allow an intruder to get a leg up on your fence. Vinyl fences work well for security fencing. 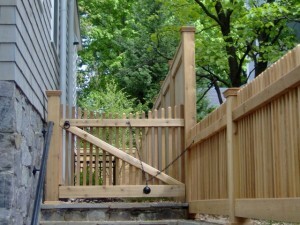 Residential fencing can provide a number of safety solutions for your home in Richmond. If you have a dog, a fence is a necessity to ensure it doesn’t run away. If you have a pool, local regulations will require you to get a fence to enclosure the pool. And if you live in an area where there is a lot of wildlife, a fence keeps animals from wandering on to your property. There are a number of fences that work well for safety, including wood, vinyl, and aluminum. Are you interested in learning more about residential fencing in Richmond? We can help you choose the right fence for your needs. Hercules Fence of Richmond has been providing professional fence installation and service in Richmond for more than 50 years. Call us at (804)752-7992 or contact us on our website to learn more about residential and commercial fencing in Richmond. This entry was posted on Friday, January 16th, 2015 at 9:41 pm. Both comments and pings are currently closed.